Last year we marched in ever greater numbers and got the People's Vote into the public and MPs' consciousness. The last march was huge but, with just weeks to go, we must now march again. This is the one. This march must be truly colossal in scale! We, the people, demand a People’s Vote on the outcome of the government's negotiations. It’s the only democratic choice. 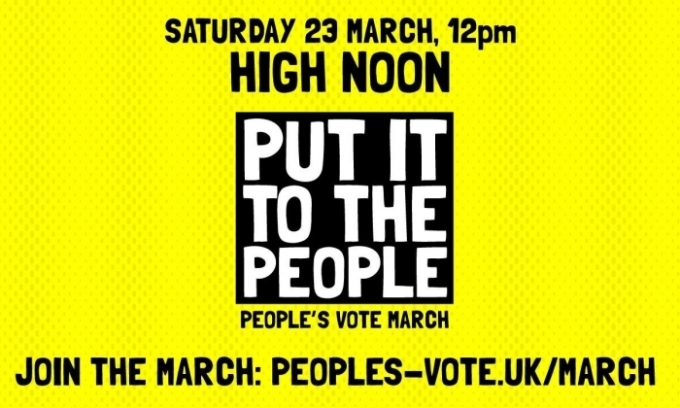 Join us for the People's Vote Put It To The People March in London on Saturday 23 March 2019. CLICK HERE for detailed coach travel information including departure points etc. Sharing the journey with 50 kindred spirits on each bus will be fun and we plan to make this a really enjoyable day to remember right from the early start to the late finish. We hope that you can help us to comprehensively beat our previous record of 9 coaches. Bring as many friends along as you can. We will be organising coaches from all over Devon, and there will be low cost tickets for under 25's, and a chance for you to buy tickets for others to travel for free. Book your coach tickets NOW! Click HERE. We will be dropped off close to the start of the march and collected not far from the finish, so we can all stick together and make Devon’s presence unmissable. It is essential that the fight to stop Brexit is not seen as a London only issue. BRING YOUR FRIENDS & FAMILY AND HELP MAKE HISTORY! If you are making your own way to London, we hope you can join the Devon for Europe contingent, so we can all march together. We are meeting at the Achilles Statue in Hyde Park (meeting point shown in BLACK on the map below, there should be someone at the meeting point with a Devon for Europe banner from 11:30 onwards. Those travelling on coaches will also meet at this point. We cannot guarantee that we will be able to locate each other, but will try our best. The map also shows the route of the march. To see descriptions for everything marked on the map, click on the rectangular icon with the arrow (top left) to bring out a side menu. To see a larger map click on the rectangular icon on the top right. 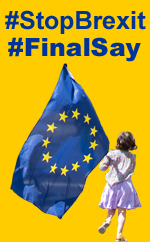 The Devon for Europe coaches will be departing between approximately 16:45 and 17:30 from Tothill Street SW1H 9LQ, gathering there from 16:30. The meeting point and suggested walking route are shown in purple above. Tothill Street is 4 minutes walk from Parliament Square. Head south towards Victoria Street along Broad Sanctuary. Turn right into Storey’s Gate (Central Hall, Westminster will be on your right) and then left into Tothill Street . Please be there promptly if you want to catch up with us before we leave! BE AWARE THAT THIS MAY CHANGE ACCORDING TO POLICE WISHES. Our march will be family-friendly and good-natured, as usual, but please be aware that the massive size of our march and the counter demonstrations mean that there will be a significant police presence at our request. PLEASE BE ALERT TO EMAILS AND WEBSITE UPDATES FROM US. POLICE PLANS ARE STILL EVOLVING AND OUR PLANS MAY CHANGE.